The Easter week went amazingly with a trip down to a place well-known for its picturesque natural beauty - Mackinac Island. Located in Huron Lake, the island has a quaint appeal that soothes your mind. Living in an island like this amidst a breathtaking backdrop surely is a lot of fun. I was green with envy for those who have their houses and mansions there and live a life so close to nature, away from all the cacophony and humdrum of city life. I don't have adequate words to describe the iconic beauty the island is blessed with. It's something that has to be seen and felt inside your heart. I wish I could post the snaps, my hubby has captured painstakingly, here but since I want my cooking blog to remain focused on cooking with pictures of home cooked food only, I will share the link once I update my other blog - Travelogue with a write-up on Mackinac Island. 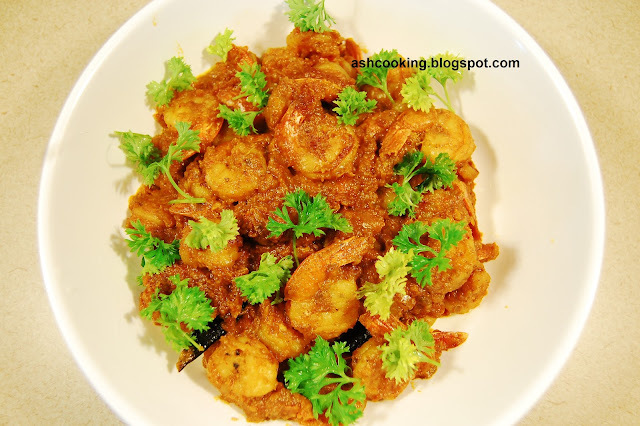 Back to what my post is all about - Masala Prawns is a preparation my mother often makes at home. 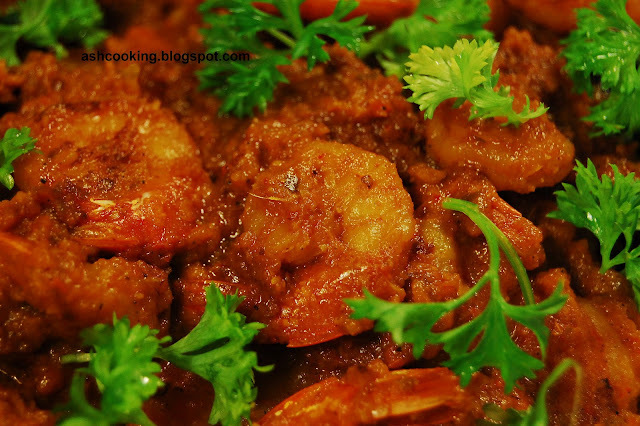 It is one of the most tasty prawn curries that I savor to the utmost delight and satisfaction of my tummy. It tastes best when cooked by my mother, however, in her absence I make do with what I end up cooking. 1) Grind tomato, onion and green chillies into a fine paste. Keep aside. 2) Rub salt and a pinch of turmeric powder on prawns. Toss them well. 3) Heat oil in a non-stick skillet. Shallow fry the prawns in hot oil and take them off the flame. 4) Into the same oil, add dry red chillies and allow them to sputter. Then add onion, tomato and green chillies paste. Sauté for few minutes. Add ginger and garlic paste. Stir around. 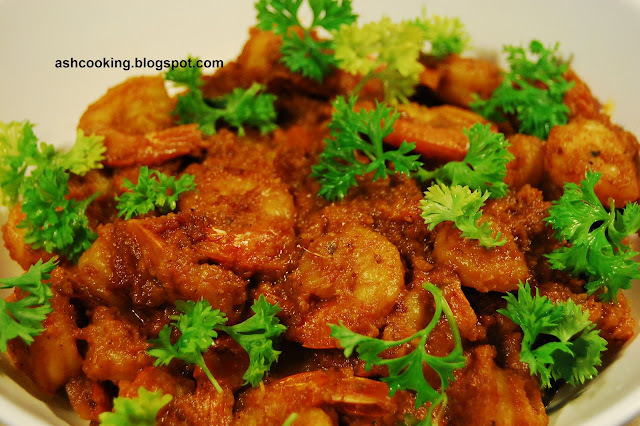 6) When oil floats on the surface, toss in the fried prawns. 7) Add 2 tbsp of water and cook covered till prawns are tender. 8) Garnish with parsley or coriander leaves. Serve with hot steaming rice.